Now…to preface this blogpost, I know what it really comes down to, is priorities. If you can honestly tell me and yourself that your health is a TOP priority for you, you’re going to find a way to fit Shakeology into your budget. If your health is honestly not a priority for you (at least not yet), then you’re going to find an excuse/way to not be able to afford it. And that’s fine…for now. You just have to be honest with yourself. We all have different priorities — what I find to be a ridiculous thing to spend a lot of money on, you may feel the same way about the money I spend on the food that fuels my body. If you’re not ready to face facts about your state of health, that’s fine. I’m here when you’re ready to change it around! And I’d LOVE to help you and educate you on building a healthier, happier YOU! 1. 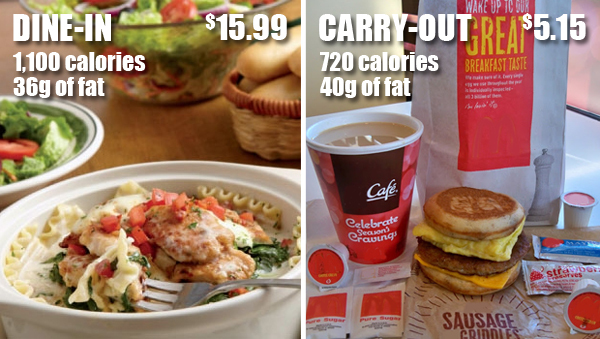 Dine-In/Carry-Out – Take a look at how much you’re spending on going out to eat each week. Whether it’s just you or your entire family, restaurant [and even fast food] dining can put quite a dip in your monthly “budget”. Shakeology’s less than $4.50 a serving/meal/day, and it has WAY MORE vitamins, minerals, and nutrients than ANYTHING you could order and eat at a restaurant. I don’t know about you, but where could you possibly get a meal for $4.33? So not only is restaurant food expensive, but, more often than not, you don’t even know where that food is coming from and/or how it’s being prepared! At least with Shakeology, you know it’s made from 100% whole foods and sourced from the best possible places all over the world! 2. Starbucks [and the like] – So maybe you don’t go out to eat very often — good for you! But guess what? Those daily [and sometimes 2-3 times a day] trips to Starbucks/Dunkin’ Donuts/Peet’s/Caribou/etc. are just as bad!! How much do you pay for just ONE of those fru-fru drinks?! At least $4, right? AND THAT’S JUST A BEVERAGE!! So add your weekly coffee spending to the amount you spend on actual food = you’re out a shocking amount of dough – and you’re spending it on something that isn’t doing you any favors. Coffee of any kind doesn’t fill you up like a meal does. Then you say “But I need my caffeine or I won’t be able to function!” So completely untrue. 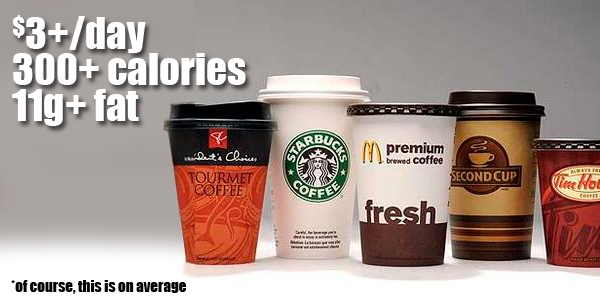 The reason your body is tired, is because you’re fueling it with toxic things like coffee and processed foods. If you start fueling your body with actual nutrients, it won’t “need” coffee/caffeine in order to “function” — it will be functioning just fine when you start adding Shakeology to your morning routine. With Shakeology, it’s consumed like a beverage, but very much holds its own in the meal department. So consider it your coffee replacement! BOOM. 3. Alcohol – This is for all of you that still go out drinking every weekend. Heck — even just 2 weekends a month! It’s been a long while since I drank — much less ordered drinks in a bar/restaurant — so I can only imagine how much drinks cost “nowadays”… But it’s rare when one can get a drink for less than $4, am I right?! And when you’re “out drinking,” who orders just ONE drink?! Nobody that I know… So how quickly do those $4 beers/cocktails add up, hmm?? After paying your tab, buying rounds for others, leaving tip…I bet you easily rack up over $100/month on just alcohol, huh? Doesn’t that make you sick to think about? And we all know that alcohol is really just poison, right? I mean…think about how you feel the next morning — your body is NOT happy. And guess what? Yup — Shakeology’s only $4.33 a day! And it’s good for you! And it’s delicious! And it’s drinkable! 4. 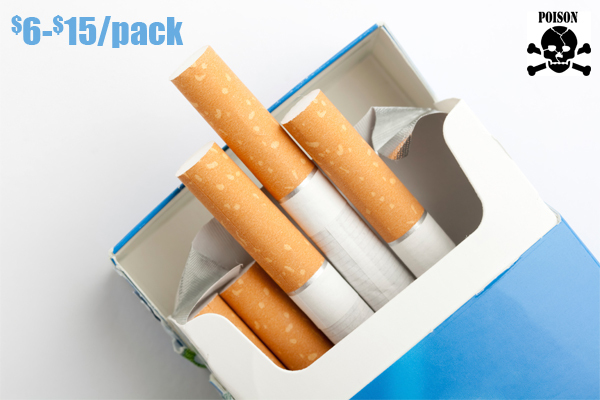 Cigarettes – We all know they’re: 1. Expensive 2. Horrible for you. Need I say more? 5. Vending Machines – If you’re one to get “food” from a vending machine, you and I both know that it’s, more than likely, a more-than-once-a-day habit. And we also know how overpriced the “food” in vending machines are. Aaaannnddd if you think anything in that vending machine is good for you, then we’ve got a problem. Skip the vending machine junk food, and grab a Shakeology packet instead! Easy, cheap, and healthy! 6. 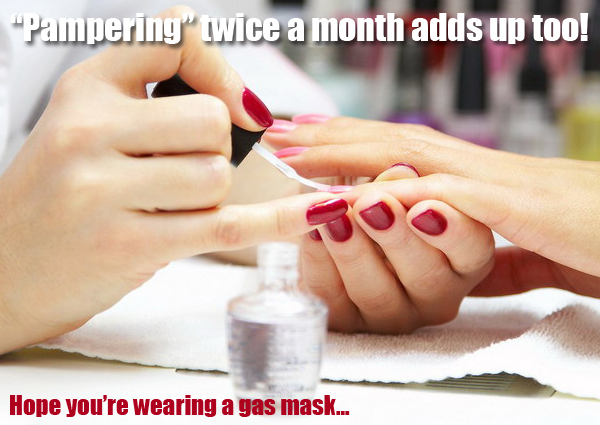 Manicures/Pedicures – While this is a “treat” I’ll never understand, I know a lot of you love to “pamper” yourselves with twice-a-month trips to the nail salon. And that’s all well and good — if you can afford it! Now depending on your salon and what you get done, etc., the cost of getting your nails done every month can run ya $25-$75, yes? And I’m gonna venture to guess that if you’re one to get your nails done, you probably get your hair cut and colored at least once a month, too, yes? Now I’m not saying just let yourself go and don’t do things that make you feel better about yourself. Again, I’m just challenging you to take a step back, and see what kind of cash you’re spending every month on your nails, toenails, hair, tanning, etc. 7. 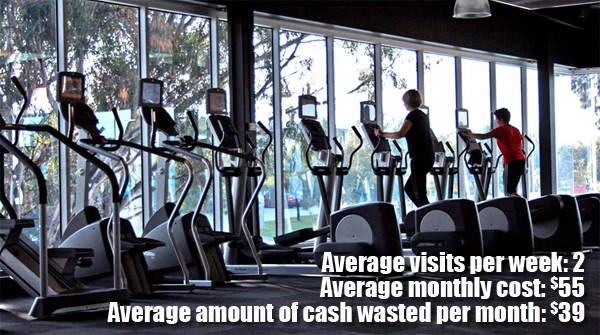 Gym Memberships – Now these are only a waste of money if you 1. Never go to the gym or 2. Have been going to the gym 6 times a week for 6 months, and haven’t noticed any changes/improvements in your body and/or health. So cancel the monthly gym membership you never use, and use that money to buy yourself monthly ShakeO. And if you want to see changes/improvements to your body and health, get yourself a Challenge Pack: Shakeology + Workout Program of your choice FOR A STEAL. Interested? Let’s talk. Shakeology will completely change your health for the better. You’ll have more energy, your cholesterol, blood pressure, and blood sugar levels will all lower…sometimes so much so that you’ll no longer need your prescriptions — or at least a much lower dosage! This means less money spent on drugs…less money spent on doctor’s visits (you’ll notice you’ll hardly ever get sick)…IT ALL ADDS UP (or evens out)!